A True Tung Oil Story + A Fun Recreation! This recreation is based on a testimonial by Les O in Missouri. Flip through the images to watch our recreation! Read it in Les’ own words. I just rediscovered an ax and hatchet lost for 4 years. Found them in my woods. The ax stuck in a stump and the hatchet lying beside it. I had put several coats of Dark Tung Oil on them, wood and metal. They were dirty but cleaned up fast with water and a little soap. The only signs of being in the elements of SW Missouri for 4 years, was a little rust on the metal where the Dark Tung Oil was worn off. I used it on all my wooden handled tools and even on bird houses. It is great on yard sale tools that have weathered but serviceable handles. I sanded and applied several coats of Dark Tung Oil. It seals and even tightens up the small splits in the wood. Every fall when I put my tools away, I clean then apply a thin coat to the wood and metal. The metal stays rust free until it is worn away by use. I use your Tung Oils on furniture as well. It is the finish of choice for me. I use it under paint for adding long term durability to my projects. 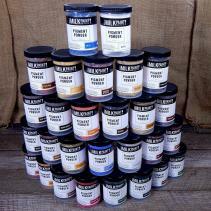 Thank you Real Milk Paint Co. for providing this great product. Hope this can be helpful to some of your other customers.